After attending a church one day that didn’t have a handicap ramp, and realizing the division that it had the potential of causing, Reverend Mark Williamson Sr. decided to do something about it. He found that although it was such a small need, when it was fixed, it made a big difference, and so from that moment on he began building handicap ramps for churches that didn’t have any. 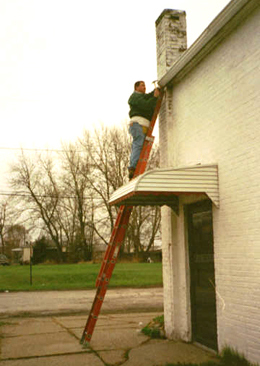 While fixing the ramps, he also began noticing other small things that churches weren’t doing to help the elderly, disabled, and poor. All of these things combined moved him to start his own ministry in 2004. Not only did he build the ramps, but he began completing small repairs and other little projects for people free of charge. “We try to get the jobs that fall through the cracks,” Williamson said. Today, Williamson along with other board members and volunteers work daily to help people with projects in their homes and churches. An elderly woman once called them after seeing an article on their ministry in the paper, explaining that she had been calling other agencies for over six months and no one came out to help her. It shocked her when Lift up Ministry volunteers said that they would be at her house in a day or two to help. Whether it’s the small task of changing a light bulb, or moving an air conditioner, they do it. “When you’re in a wheelchair you can’t change light bulbs,” Williamson pointed out. He met another gentleman in the hospital not long ago who had no one to cut his grass, so he is mowing his grass until he can get back on his feet. This ministry is drawn towards serving the community. “We’re here to reach out to people in the community that no one has been there for,” Williamson said. Whether its people who’ve heard about it through the newspaper, word of mouth, church or wherever, Williamson makes it clear that they will do anything that they can within their means to help them. If they are unable to afford certain repairs, or give away what someone asks for, they refer them to a place where they can get what they need. They’ve also make sure to involve themselves in other events to help the community, including Keep Akron Beautiful, where they cleaned the park, and the Ohio Summer Food Service Program, which feeds poor children. Each year they have a walkathon on the last Saturday of the month in July - this past summer being their fifth year. This walkathon is the main way that they generate money to bring in the resources that they need. For this event they contact organizations to donate items that they can give away to those who’ve offered a contribution. At one of their biggest walks, 22 people came out. “This year we’ve been blessed with many different sponsors coming in,” Williamson said. Nine to twelve sponsors, including the Akron Aero’s, the Canton Legends and Gladiators donated baseball caps, tickets, and other items. In the future Williamson would love to help even more people, working full time at this ministry. Right now he works a full time outside of ministry and is able to do one project a day, but he would like to bump that up to 2-3 projects daily. “We need to keep growing and having people that help us so we can help others,” he said. His passion is for those who feel forgotten. “You’re heart goes out to people and you try to help them as much as you can and get out there, by doing that you’re showing love to the community,” he said.